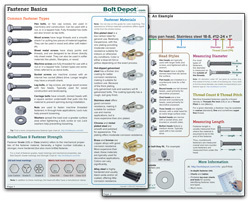 Please feel free to print these charts and tables for your personal reference on fasteners. Our 2-page, illustrated guide to basic fastener concepts - designed to quickly give you the knowledge to identify, find and use the correct fastener. Start here if you are new to fasteners. 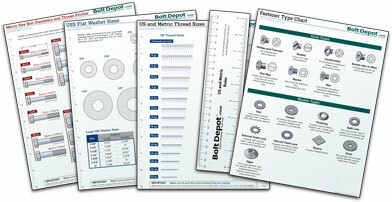 Free charts and tools in PDF format, including full size 'lay-over' sizing charts, that you can use to quickly and easily identify fasteners.